But would hiring Million Dollar Listing star Ryan Serhant and his Nest Seekers International team really do the trick? At first glance, yes. A recent Nest Seekers press release, repeated by two real estate publications, says Serhant's team recently "closed 15 new deals." Perhaps, though it's too soon to tell: most of those units have not yet closed, so we don't know whether buyers got a discount. One that did close, Unit 624, had been listed at $1,075,000 but sold for $1,030,000 (the original offering price), a 4.2% dip. But especially for some units, Serhant has a secret weapon, a stealth effective price cut, with the sticker price steady but less cost to owners, thanks to lowered taxes. The joint venture Greenland Forest City Partners (owned 70% by Shanghai-based Greenland Holdings) conjured up a way to trade the 15-year tax break, hobbled by an assessed value (AV) cap, for a 25-year tax break, with no AV cap, as explained in my City Limits article. Overall, the 278-unit building's annual tax bill of $1.2 million, announced in the Offering Plan, was already a 69% discount, thanks to 421-a. Now it would plummet by nearly $1.1 million to less than $123,000, 97% off a $3.88 million tax bill, as detailed in a recent amendment filed with the New York State Attorney General. According to the Amendment 12 to the Offering Plan, four quite expensive units have sold, though the closings have not been made public. In all those cases--three units at about $2.9 million, and one at $4.46 million--taxes would plummet. For the most expensive of those units, annual taxes would plunge from the originally projected $32,444 to $1,346. Collectively, the building's nine most expensive apartments, listed at prices from $3.45 million to $7.715 million, would see their annual taxes shrink from $302,116 (a nearly 25% discount off taxes without 421-a) to $12,445, a 97% discount. The dramatic increase in annual savings actually undercounts the overall benefit, because the earlier tax exemption would last only 15 years, stepping down over the last four years, while the new version would last 25 years, with a four-year phase out. All told, those nine units should collectively save nearly $8.8 million in taxes over 25 years thanks to the tax break, by my calculation, which is $7.5 million more than in the earlier iteration of 421-a. Still, when annual taxes for the most expensive apartment, Penthouse South, drop from $47,685 to just $1,819 (out of $57,495, without 421-a), well, the unit looks like a better deal. Annual common charges for that do remain $54,892. The now-shrunken expected tax figures, under $100 monthly for nearly all apartments, appear not only in two amendments to the offering plan but also in handouts to visitors at 550 Vanderbilt open houses. 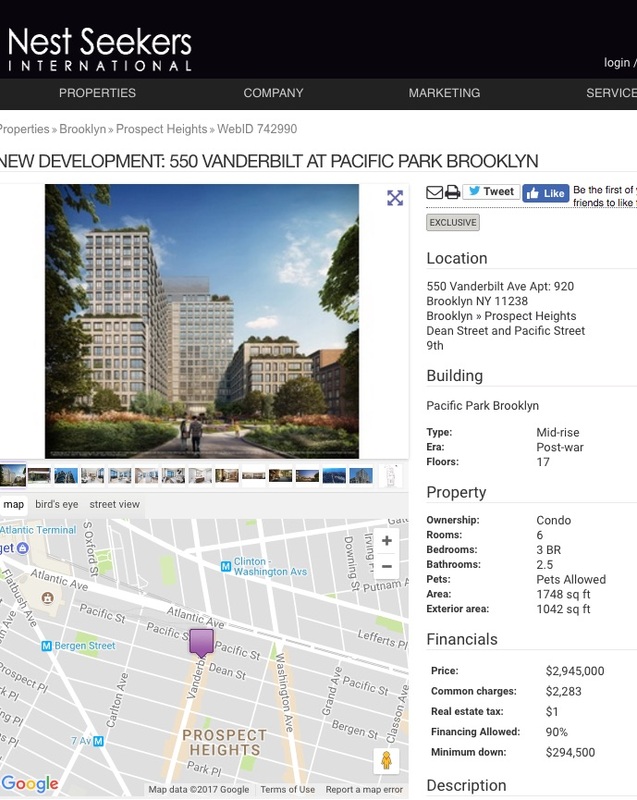 Oddly enough, after the broker switch in July, advertising for units on the three web sites--550Vanderbilt.com, new broker Nest Seekers International, and the database StreetEasy--for weeks claimed numerous units would owe just $1 in monthly taxes. By the second half of September, Nest Seekers' ended that practice, but note this screenshot from September 11 claiming $1 taxes for one unit. On StreetEasy, archived from August 7, several units were listed as having $1 taxes. As of this writing, 550Vanderbilt.com (also archived from Oct. 23 and reproduced at bottom) still lists numerous units boasting $1 taxes. Though neither the developer nor the broker responded to queries, those numbers are wrong. That Dollar Meal tax rate, if not a ruse, implies a potential developer's rebate--another discount--over an unspecified time period, which further sweetens the deal. The Attorney General’s office, after ignoring multiple queries, finally said it “cannot comment on any potential or ongoing investigations.” (Maybe, maybe not.) But the applicable state law--“All assertions of fact in advertisements must be demonstrably true"--sure seems to justify official attention.